I’m not sure if you’ve noticed me actively begging for money on every page of this website, but there’s this thing called Patreon where writers and artists and all sorts of people can raise funding for their weird, nonsensical dreams. One way I thank the people who contribute to keeping I Ate Oklahoma alive is through a MONTHLY MASSIVE REVIEW meal. Anyone who gives $10 a month or more is invited to lunch/brunch/brinner/breaksnack/dunch to try out foods with me and take part in the review process. A little blurry, just like you'll be after a few Manhattans. For our inaugural meal, we visited The Manhattan in beautiful, bustling downtown Oklahoma City. If you haven’t heard of The Manhattan, perhaps you’ve heard of the driving force behind it: Bruce Rinehart. I won’t say Bruce has never met a person he didn’t like, but I’ve never met a person who didn’t like Bruce. For more than a decade, he’s been wowing guests at Rococo and Rococo Northpark with his signature East Coast cuisine. If you love Italian food, seafood or food food, you need to know Bruce. 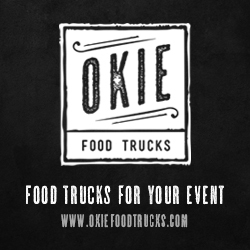 The Manhattan is his most recent project — a great little bar within walking distance of the Devon Tower and just about everything else downtown. The ambiance is perfect. On a sunny fall afternoon, the enormous windows invited in plenty of natural light and gave the entire restaurant a bright and breezy glow. The experience is somehow both polished and laid back. It’s clear Bruce accounted for every variable, but all that thought doesn’t make the place feel stuffy or stiff. 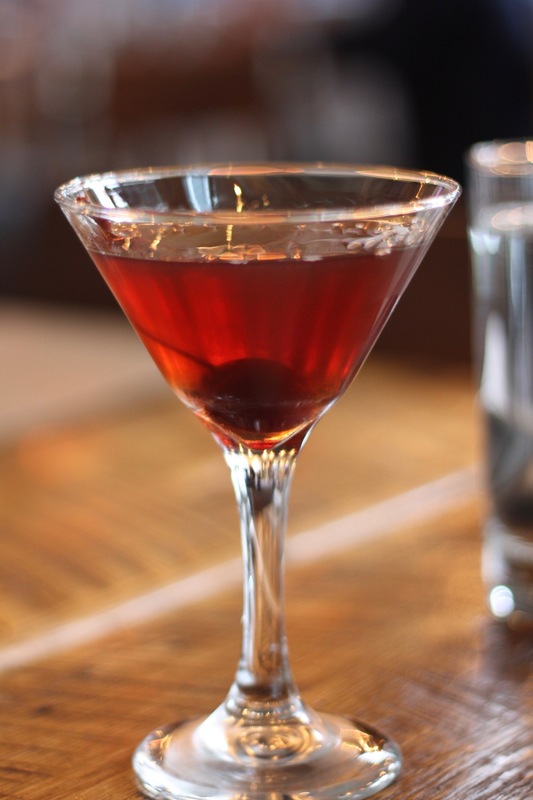 The Manhattan makes you want to dress up a bit, but it also beckons you to have a seat, have a drink and loosen up. 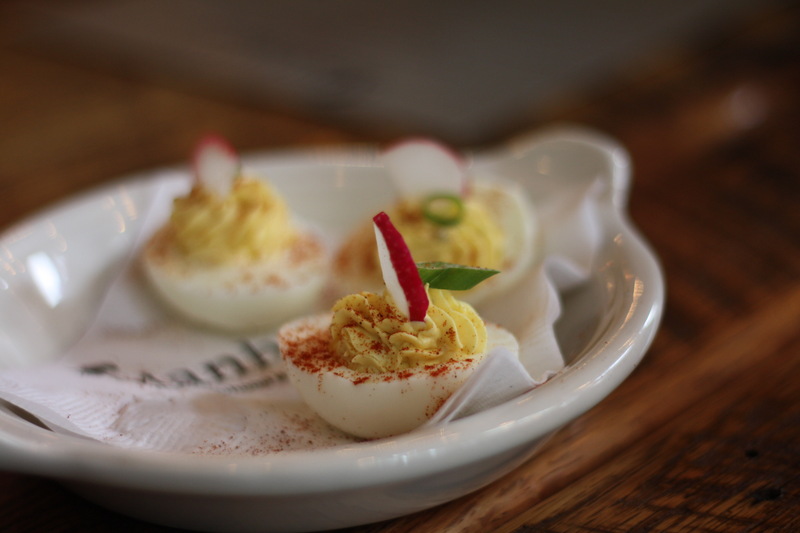 We started off with deviled eggs (4 for $4), because this is America. I found the eggs to be typical of Bruce’s focused approach of making sure the little details are perfect. Those eggs were firm, but not chalky. The filling was creamy and flavorful and held its shape. All around excellent. Everyone ordered something different. Radio/TV/real-life personality Scott Mitchell (recently named husband of NonDoc’s Person of the Year) got Zach’s House Cured Pastrami sandwich ($12). I had a taste and I can confirm that it was a mighty tasty pastrami and tender as all get out. 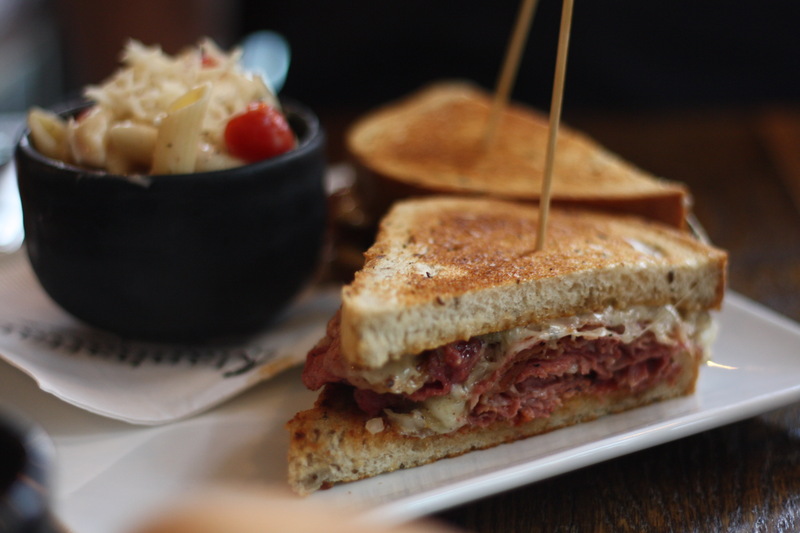 The Flying Pig BBQ’s own Boss Hog, David Greggs got Zach’s Classic Reuben ($12) and had a minor quibble. One highlight of his meal was the pasta salad. It might not have been the most sanitary move, but everyone at the table tried some and, to a man, everybody raved about it. Unlike a lot of very goopy pasta salads, The Manhattan’s version was lightly sauced, but incredibly flavorful. I could easily eat a tub of that stuff alone in a dark room during a shame spiral. Julie said she went in with low expectations because her fiance had a less-than-stellar experience there. 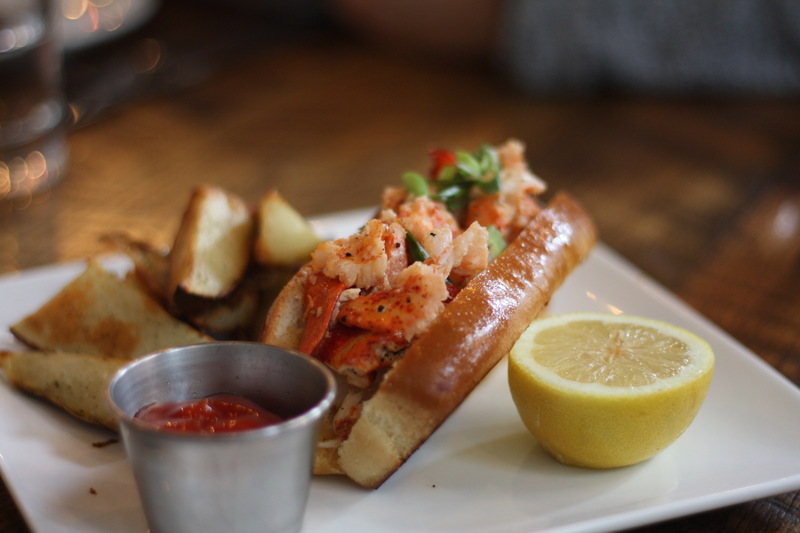 She got the lobster roll which was fine (I tried it and thought it was a little bland) and a Classic Manhattan ($10), which she was more enthused about. “I don't typically drink Manhattans, but I asked the server to suggest one to me, so I got the Classic, and I was not disappointed,” she said. Most everyone at lunch had a Manhattan at The Manhattan, because that’s what you do there. There are 17 varieties on the menu, so it shouldn’t be hard to find one that floats your boat. I enjoyed mine with the French Dip Sandwich ($11), which is my Kryptonite, if Superman were to eat a lot of Kryptonite, wish it was better, but still gets fat off of it. A quick note about roast beef: if your only experience with roast beef is from Arby’s or the grocery store deli, please please please expand your horizons. It can be so tender, so beefy, so juicy and wonderful. That stuff is technically roast beef, but it’s far from what you’ll get at The Manhattan. 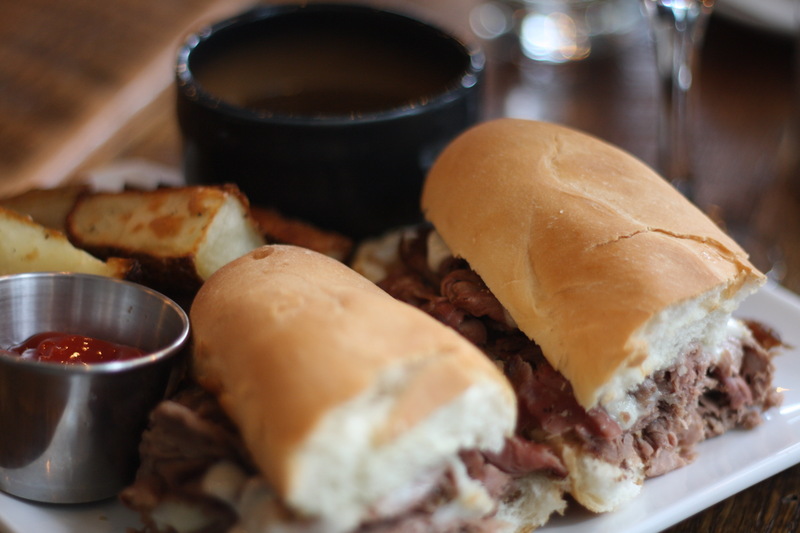 The Frenchest of French Dip sandwiches. Here you get a pile of flavorful roast beef under melted provolone on a soft hoagie roll. On the side is a lovely cup of salty au jus just waiting for you to dip to your heart’s content. The bread soaks it up and the beef holds onto the jus for a bite that explodes with flavor. Though we didn’t try one at this lunch, Rococo’s aficionados will be happy to hear that the restaurant’s signature crab cake ($20) is on the menu. “I've been there a few times and I will say the crab cake is just as good as it is at Rococo,” Greggs said. This isn’t the same restaurant, but it is an extension of Bruce’s personal brand of big, bold flavors in a comfortably upscale venue. If you haven’t been to The Manhattan yet, take some change for the meter and get down there.